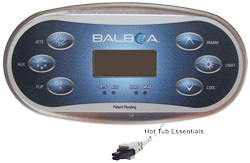 BalboaTM BP Series Platform Wi-Fi Enabled (with the addition of a Balboa Wi-Fi Module Kit). Long life Titanium 5.5 kW heater elements. BalboaTM M7 technology to prevent the heater from operating without proper water flow (this eliminates troublesome pressure switches). Proven BalboaTM BP circuit boards and topside controls. PuraSpa® control systems are engineered for easy installation and convertible for all voltage configurations. This spa pack can be wired to 110 Volts or 220 Volts. If you wire to 220 Volts for the main power supply, all component circuits can be configured for 110 Volts or 220 Volts. Balboa TP600 Top-side Control included (measures 7.1" X 3.5"). You can set the duration and number of daily filtration cycles. Digital temperature and functions read-out. Includes adapter plate for use if you currently have a larger top-side control. Solid state electronic components and circuitry, for increased reliability and accurate temperature settings. Universal 2-speed pump circuit - supports 110V or 220V (color coded 48" Smart Cord included). Universal 1-speed secondary pump circuit - supports 110V or 220V (color coded 48" Smart Cord included). Universal Blower circuit - supports 110V or 220V (color coded 48" Smart Cord included). Universal Ozonator circuit - supports 110V or 220V (color coded 48" Smart Cord included). Audio/Video circuit - supports 110V or 220V (when added, we include the male amp style cord). Heater rated at 5.5 kW on 220 Volts or 1.4 kW on 110 Volts, in stainless steel heater manifold. Heater uses Balboa M7 internal dual sensors; for temperature control and high limit protection to prevent over-heating. These same dual sensors are also used to monitor water flow and prevent the heater from operating when flow is not adequate (eliminates the use of a trouble-some pressure switch). Automatic time-out for light and pump. Compact design for easy installation - 15" heater housing (19.5" length to outside of white PVC unions), 11" height from floor to top, 3.5" depth. Wi-Fi Enabled (with the addition of a Balboa Wi-Fi Module Kit). You have the option of adding the Wi-Fi kit at a reduced price above or you can purchase later separately. Digital topside control with adapter plate (use the adapter plate if replacing a larger topside). Heater fittings with o-ring gaskets. Backed by a 2 year manufacturer's warranty on all parts.